You arrive to Hong Kong and want to book your transfer to downtown Hong Kong. Upon your arrival into Hong Kong, clear customs and collect your luggage. The Arrival Meet and Greet will be by a Tour East representative in uniform. Airport Meet and Greet location will be at the public greeting hall outside Exit B, near Service Counters 3 & 4, after clearing immigrations and customs. Clients who arrive and come out through Exit A need to turn right and make their own way toward the above area. For shared transfers service is available from 7:00am to 11:30pm only - Private car transfers are available at your chosen time (transfers operate 24 hours a day, 7 days a week). When making a booking, you will need to advise your flight details and your accommodation details. Your transfer will be confirmed within 24 hours and you will be provided with a travel voucher to present to the driver. Welcome to Hong Kong International Airport. Click on the "Book this product" to book your door to door ground transportation service - Shared or Private. Sheung Wan, Central, Admirality, Wan Chai, Causeway Bay, Tin Hau, Fortress Hill, North Point, Tsim Sha Tsui, Jordan, Yau Ma Tei, Mong kok and other Kowloon districts are served - These districts are as info only - For confirmation please book online. This transfer must be booked at least 72 hours in advance of your travel date - Confirmation for this transfer will be received at time of booking - The brand of vehicle used may vary depending on your specific travel date - Please note this is a ONE WAY transfer only - Don't forget to book the return transfer online. Pricing Policy: Infant/Child prices are not available, adult prices apply to all travelers. Infants must be seated in the lap of an adult. No child seats or baby capsules are provided. 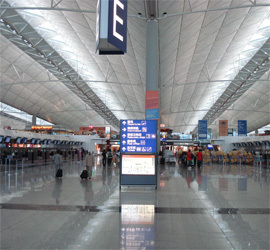 Book your Hong Kong airport transfer online before you go and ease your arrival to Hong Kong. Welcome to airport ground transportation portal for Hong Kong City : We provide information about ground transportation and a directory of transfers services between Hong Kong International Airport and Hong Kong Island or Kowloon... Taxis - Shuttles - Limos - Express Train.